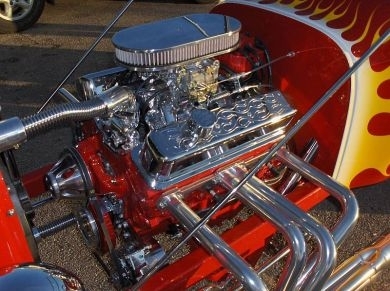 Dress up parts for your T bucket, Model A, '32 or Hot Rod. Spirit offers from valve covers, air cleaners, starters, alternators, steering wheels, gas pedals, mirrors, oil and transmission pans, headers, differential covers and many more items. Keep checking back for more products. Spirit usually can beat Jegs, Summit, and other parts store prices. Chrome Ford 8.8 Rearend cover. This kit comes with Chrome Rearend Cover, Bolts, and Gasket. Chrome Classic "OOGA" Sound Horn.